"When you get those rare moments of clarity, those flashes when the universe makes sense, you try desperately to hold on to them. They are the life boats for the darker times, when the vastness of it all, the incomprehensible nature of life is completely illusive. So the question becomes, or should have been all a long... What would you do if you knew you only had one day, or one week, or one month to live. What life boat would you grab on to? What secret would you tell? What band would you see? What person would you declare your love to? What wish would you fulfill? What exotic locale would you fly to for coffee? What book would you write?" A couple of days ago, my friend who is graduating this May with her nursing degree-told me she is putting together a capstone project to mentor new graduate nurses. She sent a message to all new-ish nurses in their first or second year that she knew, asking for a collection of advice from all different nursing specialities. This is a unique collection of advice, being that she's asking from new nurses specifically. If you ask a nurse that's been in the field for 20 years, "do you have any advice for new nurse graduates? ", she won't be able to help you- being that it's not only hard for the mind to remember what it's like to be new, but every year new grads face a whole new set of unique problems. These problems stem from new technology, the health care reform, new policies, new medications, etc. I have not seen the results of this project yet but I wanted to share with any other brand new graduates out there the collection of advice I (and some more experienced nurses on my floor) put together based on my first 6 months of nursing.... Enjoy, I hope it helps! - Take each day as they come. You will have horrible shifts, you will cry. But go back again the next day with your head held high- learn something from those horrible experiences and improve each day. -Do the best you can, but more importantly- do no harm. - Accept the fact that you are learning and must always ask for help. It's easier to ask for help before if unsure about something rather than to deal with the consequences of wrong actions. - If you and you're preceptor aren't communicating it's usually okay to ask for a new one or to talk to your nurse manager. It does get better. Orientation is valuable time and time you don't get back. Make it count! - Make friends at work. They are one of the few people in your adult friendship life that will understand what you go through at work. Plus, in strict confidentiality- you're really going to need those patient-centered venting sessions. - Work together. There is a whole hospital of departments to help you, always keep your options open and don't bite off more than you can chew. If your patient is having trouble breathing, get the O2 on, then get your respiratory therapist up there to help. Ask other nurses on the floor to come in and help, or if you just want a second opinion. -Find a healthy way to vent- write things down, or start a blog, or exercise, talk to a friend in confidence- preferably someone who also understands the medical field- or someone that doesn't mind hearing about the nasty stuff you have to do! - Know your doctors well, know their quirks. Know who to call for what and when (that WILL take time to develop that skill) and if you are EVER in doubt of whether or not to call a doctor, CALL! Its their job to take calls about your patient, don't let them convince you otherwise. - Don't be afraid to show initiative. Don't be afraid to suggest treatment or medications to doctors. Doctors don't think of everything, you know your patients best and your patients will thank you for it. - Try really hard to never piss off your nurse manager. She/he owns your life. - Even if you can't stand your patients, try hard to maintain continuity of care from day to day. Your patients will appreciate this, and you really get to know whats normal and not normal for your patients. You will start to learn what normal temperature range they run in, what their snore sounds like versus difficulty breathing, etc. - Never befriend the drug seekers. Even if you are Ms.SuperNiceAlltheTime (like me, I had to learn this the hard way), try really hard to stand your ground on the rules, maintain respect and professionalism. Many of the drug seekers will be your age and will attempt to seek you out and "be your best friend", therefore attempting to get more drugs out of you. Be kind to the nurse following you, and don't break any rules with these types of patients. It's not helping anyone in the long run. - Never underestimate the placebo effect, but use it wisely. - Never feel like you should crash your car into a tree if you make a mistake. Because of that mistake- you grow and will never make it again. Move on. - One day you will realize you aren't the newest nurse on the floor anymore. This will feel really good! You will see how much you've learned when you stand next to a brand new graduate. But always remember this : remember how you felt when standing in those shoes and always lend a helping hand. Never be condescending in report. Work together, help each other learn new things. No one gets anywhere if nurses don't pass along their knowledge. Always remember what its like to be new. - Get organized! Your shift will go so much easier if you come in with a plan on how you are going to budget time in your day. Make your own or borrow someone else's assessment sheet or report sheet, one that works just for you. - If you are ever stuck in a "What do I do???" situation, like if your patient is presenting with a situation and you have no idea what is going on-stay with your patient. Call for help. Either take vital signs, or get someone in the room to take vital signs and stay with the patient while you go get more help or supplies. Vital signs will tell you a LOT about what your patient is doing. - If an IV pump is giving you issues, just try flushing the line. - If a patient is complaining about their IV site (it itches, it burns, it hurts), but the site looks good- try and change it anyway if you have time. Sometimes that first complaint is the first sign of an infiltrated line. IV's aren't supposed to hurt (after they are in). - When you admit a patient to your unit, do your best to go over your patients entire plan of care. Patients don't like it when things come as a surprise. They find out they are going for an MRI when the wheelchair is pulling in, that doesnt look so great. An example of what I do is just go over every single order written for them, and patients love it. "Your diet will be a Heart Healthy diet, your activity orders are for you to stay in bed because of (insert condition here), You will getting this antibiotic every ? hours for this infection, if you have pain let your nurse know and you can receive "this" for pain, if you become nauseous at any time, let your nurse know and you can receive "this" for nausea. Our lab department comes at 5 am and your doctor has ordered for you to have labs drawn tomorrow morning. We will be taking your vitals every 4 hours, including overnight. You will be going for the following tests tomorrow....." Tell them as much as you can. They will be thankful. It also helps when you do this in front of family if possible, so more ears can hear it if one pair of ears forgets what you said. As with all my other pages you see at the top of my blog, I am always updating them. So check back occasionally, I may have thought of another piece of advice to share. I hope these guidelines help you in your first year of nursing, but don't let them rule you either. You have to find what works best for you, from a wide collection of advice from multiple sources. Thank you for sharing your blog. I am loving to read about your experiences as an RN, as I am also an RN and can relate to so much. This post for the new nurse. I am also a nurse. So I have read this post very carefully. You also attached your Nurse friend experience. I also want to know about capstone project nursing information. Thanks for sharing this post. If you want to capture the special movements in this area, then get the special blog time from this area. For the best moments of the latest project you can get the https://www.psydissertation.com/interesting-and-informative-thesis-on-depression/ for your best work. Your post is very interesting and thought provoking at least for me.I am these days busy on http://bachelorthesis.biz/.You guys can also check it out.Thanks. I am an RN, but I am a writer at heart. I write novels, short stories, poems, you name it. 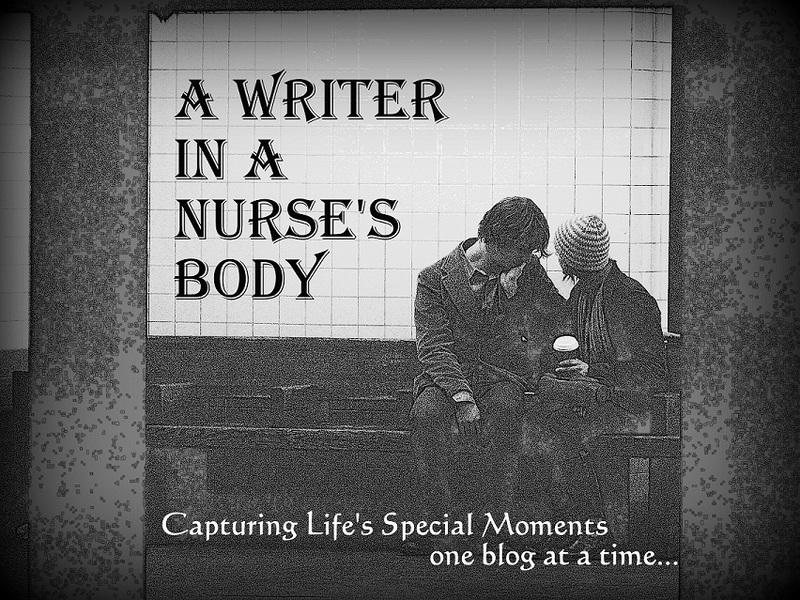 This blog composes about my many nursing experiences (comedic and emotional), in addition to current events,love, ethics, movies, music, environment, nutrition and health, and other random occurences in my crazy life. I am also a born-artist. Even though I chose nursing, the good thing is, I can do both. They complement each other and I can use Art in nursing and my nursing in my Art. Look forward to lots of nursing stories along with many random bouts of insanity! Enjoy reading and thank you for visiting! What are you looking to read about? One too many topics too choose from...! I'm Sorry Sir, Repeat That Please? New nurse, in the hood. So long, farewell, auf Wiedersehen, good night. Quote at top of page is from movie, "One Week", 2008. Copyright A Writer in a Nurse's Body. Travel theme. Powered by Blogger.